← What in the World is WWOOFing? It’s been weeks since we’ve written. We were tired. Here’s a song to listen to while you read, if you’re so inclined: Someone to Ride the River With. 9,200 miles in less than 3 months, 64 farmers markets and 96 gigs total. The North Union Farmers Market at Shaker Square is a year round, producer-only market with over 100 vendors and a lot of great energy. This market is set on two parallel streets and a train runs down the middle! There is a park, a band stand, trees and Dewey’s Coffee Shop, one of my favorites in Cleveland. Emma Anderson is the manager of the Shaker Square Market but was out of the town the day we were there. This is Tiffany Leeper who was covering for Emma. Here she is getting ready to show us her behind-the-head rock star moves. The photo was actually taken at Crocker Market,, which she does manage. She is a get-your-hands-dirty manager, walking the markets from end to end helping vendors set up tents, run electricity, solving problems and I think sneaking bites of samples when the vendors were otherwise occupied. Fearless with the guitar. 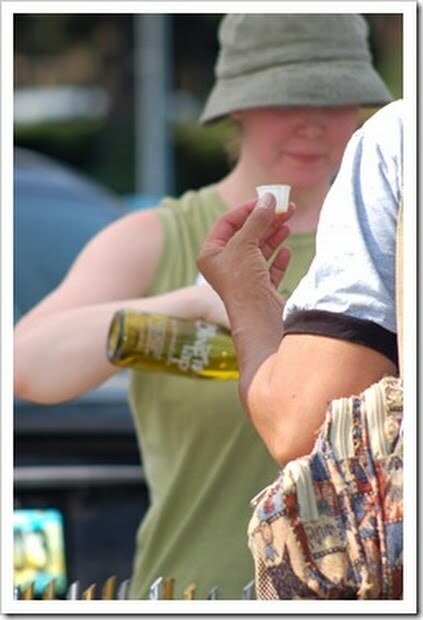 About Shaker Square she wrote: “… the greatness of that market is due to her [Emma’s] hard work!” It is a GREAT market! Meet Diane Sikorski of Humble Pie Baking Company, one of the best bakers and jam makers in the northern hemisphere. And I’m not saying that because she let Lilla the beagle stay at her house, and Lilla insisted we stay too: shoppers and chef owned restaurants will swear to her goodness. We got a look at her ingredient sourcing and commercial kitchen. We’ll be featuring her in a “behind the scenes” blog later. In the meantime, yum. We run into many of the same vendors at different markets when we play in areas like Cleveland and Denver. We played at 7 different markets in Cleveland and 21 in Colorado: you start to feel like you know everybody! In 1922, a group of doctors planted fruit trees on 125 acres of land and ran a roadside stand. In 2005 Matt Vodraska (pictured above), his brother Chris and their parents bought the land and “…started from scratch.” Here’s the fun part: Chris was in a doctorate program and decided he wanted no part of a basement laboratory. Matt was in art school practicing photography and glass work. It’s not a good picture of her, but that’s Frances on the right in the yellow. Frances works the markets for them. Rittman Orchards grows 20 varieties of squash, zucchini and various veggie crops along with tons of fruit. They sell to Cleveland Clinic Hospitals, their own farm stand and numerous restaurants, including the Flying Fig where Karen Small creates gourmet dishes with locally sourced food. Our friends ask us why we love Cleveland. Cleveland GETS fresh. They showed up in a flatbed truck piled with veggies and left with nothing but corn husks. 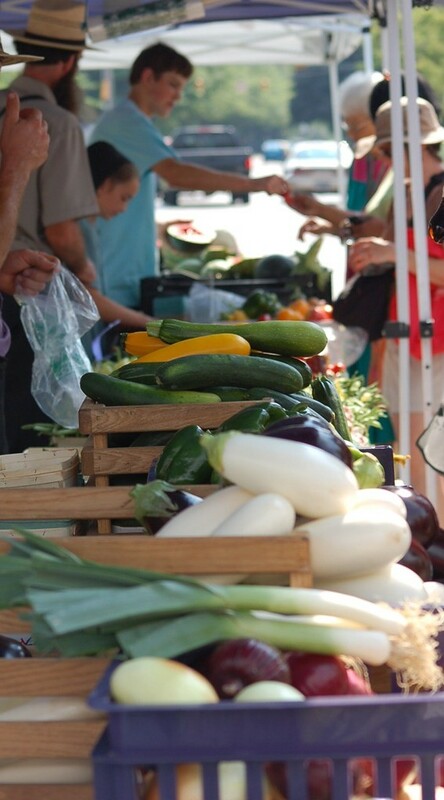 Read all about them in the Crocker Park Farmers Market Blog. Oils and vinegars. I’ve been cooking with them for two years now and love them. This entry was posted in Messages From the Founders and tagged coco and lafe, crocker park, farmers markets, farms, Get Fresh 100 Market Tour, north union farmers markets, oasis acres, Real Time Farms, rittman orchards, shaker square farmers market, the olive tap, weaver's truck patch. Bookmark the permalink.